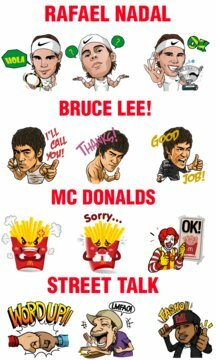 Fun Chat emojis, emoticons and chat stickers All in One! 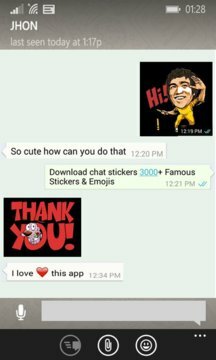 Stickers, Emojis and Emoticons Reshapes your communication like never before, High quality designed 3000+ high quality HD stickers for Windows phone texting, Messages,WhatsApp, Kik Messenger, Facebook Messenger,KakaoTalk, Instagram, WeChat, Line, Tumblr, GroupMe, Telegram, Messages, QQ, VK (ВКонтакте), Mail, Twitter, Facebook and Weibo etc. Its compatible with all social networking services App’s available on your windows phone, all email apps ( gmail, outlook, yahoo, AOL etc.) And all text sending apps. Assign Stickers to Contact, Save Stickers to Camera Roll, Print & Copy.